Permoxin is a well concentrated permethrin based insecticide to prevent fleas, ticks, flies and biting insects on dogs and horses. This advanced formula helps to control paralysis tick and prevents Flea Allergy Dermatitis in dogs. The topical solution manages fly nuisance on horses and protects them from Queensland Itch. Acting as insect repellent, it provides greater relief to flea allergic dogs and controls various flies on horses. It is suitable to use on pregnant and lactating animals. 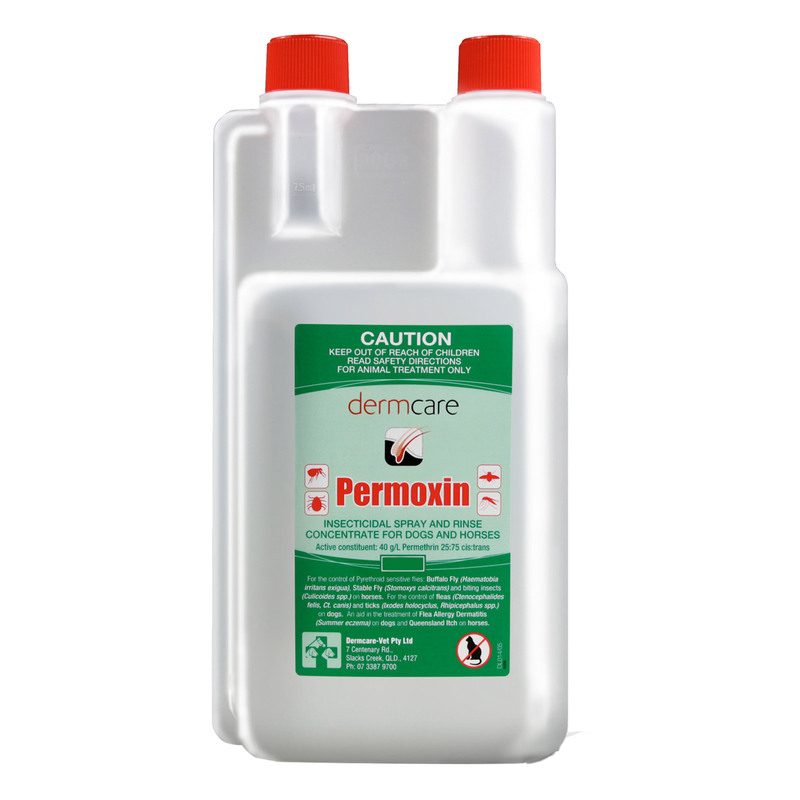 Permoxin utilises advanced technology that allows the ingredient Permethrin to bind to clean hair and skin for long lasting effectiveness. This ingredient repels fleas and ticks from attacking dogs and horses. Permethrin resists inactivation by light, thus ensures longer duration of action than the natural pyrethrins that quickly decompose when exposed to sun and air. Permoxin can be applied to wet or dry coat. Dilute the solution at the rate of 10ml to 400ml of water. Use as a spray or rinse. Spray the entire body of the animal at the distance of approx. 20cm. Apply against the lay of the hair, and make sure that the entire coat of the animal is thoroughly wet with Permoxin. Ruffle the coat as the spray is applied, especially in long haired or densely coated animals, so that the product penetrates down to the skin. If using the product as a rinse, apply after shampooing and rinsing. Use sponge to assist application; foaming does not affect efficacy. For flea and tick control, use the product as a rinse every seven days. For insect-bite allergies, spray the product daily for up to 14 days. Permoxin is highly effective tickicide and insecticide. It prevents fleas for 20 days and ticks for over 2 weeks. This flea and insect repellent repels fleas and gives relief to pruritic dogs. With no possible side effects, it can be safely used for longer time. Its resistance to light ensures a longer duration of action compared to natural pyrethrins, which decompose on exposure to air and light. Permoxin is safe to use on pregnant and lactating animals. Wear gloves when treating your pet. Avoid contact with animal’s eyes and mouth. Store this product at room temperature, below 30°C (86°F). It is highly toxic to use on cats. Do not use on animals less than 12 weeks of age. Avoid eye contact and keep it away from mouth. Do not use, if your pet is hypersensitive to permethrin. I was fed up of flies and ticks on my dog. They never seemed to go away. Ever since I have started using Permoxin, I am so much relieved. Very helpful in keeping fleas and ticks away. No side effects and safe for my dog, Vito. I am using it regularly .I found this highly effective.My pup was highly infested with fleas,but now he is doing good. I use it daily, mainly for flies and those tiny midges as my dog is allergic to insect bites etc, it is non - toxic to dogs and I have had no side effects, I recommended it.